Early concepts show what a cycle track could look like on Maple Street looking east toward the intersection of Arkansas Avenue. 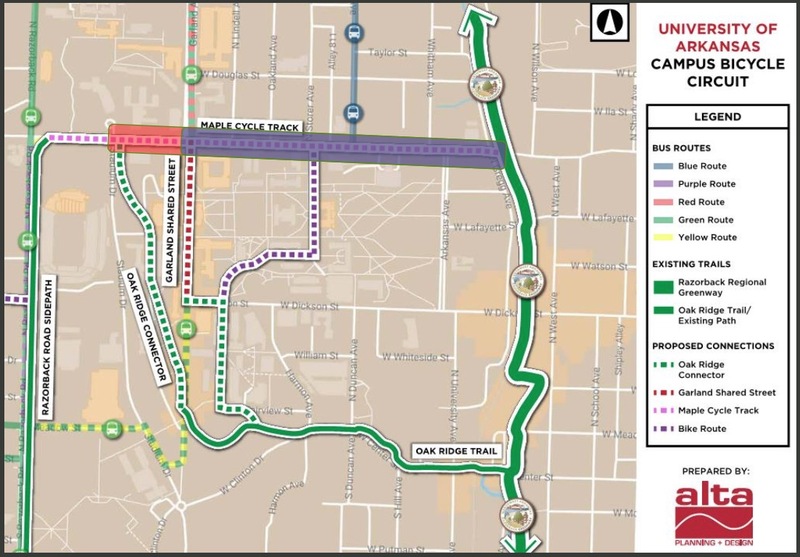 University and city officials plan to construct a cycle track along Maple Street to better connect the campus to the Razorback Greenway. Representatives from Olsson Associates and Alta Planning & Design this week presented preliminary concepts for the project to the City Council’s Transportation Committee. Mandy Bunch with Alta said the university-led project has been in the works for about 18 months and is part of a proposed bicycle circuit through the campus. 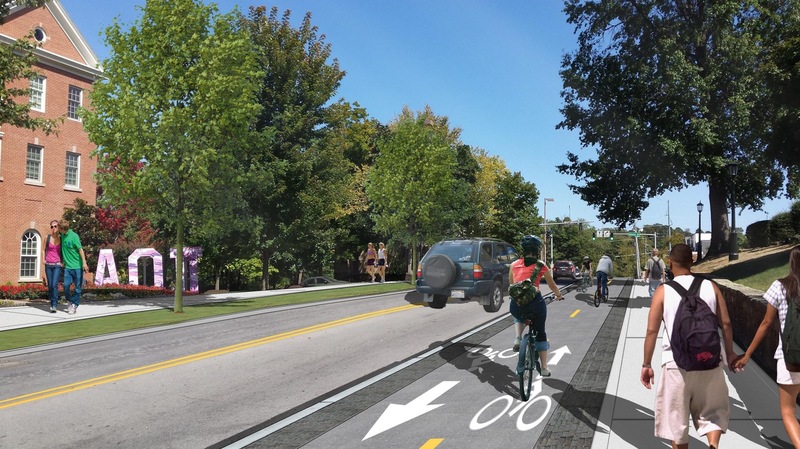 Early plans show a 12.5-foot cycle track on the south side of Maple Street from Garland to Gregg avenues. The Razorback Greenway crosses Maple just east of Gregg by the newly renovated historic bridge. The cycle track would be separated from the vehicle travel lanes by three or four feet, and raised by at least six inches. Vehicle lanes would be 11 feet wide to accommodate UA transit buses. Eight-foot sidewalks would line the roadway, with separated landscaping on the north side of Maple, and bike-specific signals would be placed at Arkansas and Gregg avenues. Much of the space needed to add the cycle track already exists on Maple, but some adjustments will be necessary. Brad Hammond with Olsson presented the results of a recent traffic study in the project area. He said in an effort to pull some traffic off of Maple Street, the study examined the possibility of turning some of the north-south side streets into one-way northbound streets. The findings, Hammond said, support one-way northbound traffic on Lindell, Oakland and Whitham avenues. Storer and Leverett avenues would remain two-way streets. He said it’s also possible the left-turn lanes onto Lindell and Leverett could be removed without clogging up traffic too much. Removal of the right-turn lane from Maple onto Arkansas Avenue, however, could be tricky. Hammond said officials are still working through that part of the plan, and hope to soon have some recommendations to present to the committee. Hammond said the hope is to have the design completed by spring 2019 with construction beginning soon after that. The $4 million project would be funded using a 50-50 matching grant from the Walton Family Foundation. The city and university would split the remaining cost, with the city’s portion coming from money secured through the upcoming bond election.